In the afternoon on Saturday, 10 June, a mechanized patrol approached a defensive position that was manned by some of 1st Lt. Murn’s B Company/501st men. They let the patrol get close, then opened fire killing four of the enemy. That night, outposts reported hearing a great deal of activity in the same vicinity and contact was made with the Germans several times. In one of those firefights, the paratroopers ambushed a convoy, killing one enemy soldier. When the troopers searched the dead German’s pockets, they discovered some documents that revealed him to be assigned to a reconnaissance battalion of an armored division – an ominous sign of what the Americans were up against. Knowing that such a German force was out there in the hedgerows to the west of Graignes sent a wave of nervousness through the Americans. As a consequence, that night was spent on a full alert with officers conducting almost constant inspections of the perimeter. Prior to that night, the paratroopers at Graignes had been confident that American units to the north would get through to them before the enemy could launch any kind of serious attack against their perimeter. However, the crescendo of enemy activity around the village throughout the 8th, 9th and 10th seemed to indicate that they could not expect relief to get there in time. To the American paratroopers and the French civilians in Graignes, it appeared that the moment of truth was drawing near. There was no sign of the enemy and all was quiet that morning, the first Sunday since the invasion began. That being the case, Maj. Johnston gave permission for some of the men to attend Mass. They arrived just as the parish priest, Father Albert Leblastier, began the liturgy right on time at 1000 hours. At about the same time, Capt. Brummitt heard firing south of the village, rushed to the scene and quickly determined that a large German force was approaching Graignes from that direction. He reinforced the southern flank and prepared to receive the weight of a direct attack. He would not have to wait long. Meanwhile back in the church, the firing rudely interrupted Father Leblastier, who was ten minutes into Mass. At first he continued, but then half way through the service, a woman burst into the church yelling, “The Germans are coming! Save yourselves!" A German patrol had indeed managed to penetrate to within two hundred meters of the church, causing a panic among the assembled parishioners and American paratroopers. Marthe remembered that, “Everybody started to run away but they started shooting, so we had to stay inside the church.” During the gun battle, all of the villagers assembled for Mass had to huddle inside the nave of the church just to stay out of the way of the flying bullets. The assault, which lasted only ten minutes, had been an uncoordinated, piecemeal effort during which the paratroopers inflicted heavy casualties on the attacking force. All of the work that the paratroopers put into preparing fields of fire to cover avenues of approach had paid off, and the Germans had sustained staggering casualties. From the belfry of the church, trucks could be seen picking up dead German soldiers. As soon as the fight was over, Maj. Johnston ordered all available personnel to man the defensive line around the village. He correctly recognized that the morning attack had only been a probing action and that another assault would soon follow. At about 1400 hours, the Germans commenced a punishing mortar bombardment of Graignes. This preparatory fire was swiftly followed by a second infantry assault against the flanks of the defensive line around the village. This time the attackers moved so swiftly that the perimeter was almost breached at one point. However, Capt. Brummitt quickly shifted forces to meet the threat, and the line held. Once again, the paratroopers’ supporting fires were decisive in holding off defeat as mortar fire inflicted heavy losses and scores of enemy infantry were caught in the crossfire of the multiple machine guns defending the village center. During this second attack though, the paratroopers and the citizens of Graignes began to suffer their first casualties. The church sanctuary was then transformed into an aid station as the wounded were rushed there to receive medical attention from Capt. Sophian. Father Leblastier and Father Louis Lebarbanchon, a Franciscan priest temporarily assigned to Graignes, provided comfort to the wounded as well as several villagers. Alongside the two priests, the rectory’s two housekeepers, eighty-year-old Eugenie DuJardin and Madeleine Pezeril, also did what they could for the wounded. An uneasy quiet fell over Graignes following the second attack. During this lull, Maj. Johnston pulled his outposts back to the defensive line in the village and assessed his situation. He found that, after the morning’s two major assaults, ammunition was beginning to run low. The remaining small arms ammunition and mortar rounds were then redistributed among the defenders to provide each position with an even supply. Then, an unnerving sound was heard rising from the maze of hedgerows surrounding Graignes. What was clearly the sound of heavy vehicular movement announced that the Germans were bringing in reinforcements. Since the observed evidence indicated that Graignes was about to be the target of a major attack, Maj. Johnston sent all of the civilians away. After almost nine hours of confinement in the church during the day’s fighting, sisters Marthe and Odette Rigault were both “ready to leave.” Marthe remembered that, “At 7 o’clock (PM) Major Johnston told us that we should go home because they did not have enough ammunition for the night and the night was coming.” According to Odette, “He told us that we had to try to get out if we could.” Marthe and Odette then slipped out of the village and returned safely to Le Port St. Pierre. In Graignes, the signs were getting more and more ominous with each passing hour. Through his binoculars, 1st Lt. “Pip” Reed could see two German 88mm guns being set-up on a farm located just a few kilometers away on the heights of nearby Thieuville. At about 1900 hours, the 88s opened fire on Graignes and incoming rounds quickly swept across the boys’ school and the town square. As shells landed all around the church, “Pip” Reed looked up at the belfry just in time to see it take a direct hit. At the moment of impact, Lt. Naughton was on the field phone with Lt. Farnham in the belfry and the line just went dead. The enemy shell ripped through the observation post, killing Farnham and his assistant observer. Farnham was not the only officer to lose his life to the 88s. When the bombardment began, Maj. Johnston was at the bedside of Lt. Maxwell, who had become violently ill since arriving in Normandy. While the two men were talking, an 88 mm round tore into the command post and exploded, killing both men instantly. The artillery barrage proved to be the beginning of the final assault against the Americans at Graignes. After a thorough “softening up” of the target by the mortars and the 88s, German infantry moved in for the coup de grace. It was immediately obvious that this assault force was at least twice as large as the assault force from the afternoon battle. With the observation post in the belfry destroyed, it was no longer possible for the troopers to employ their mortars against the approaching enemy with any degree of effective accuracy. The mortar crewmen then cranked the elevation of their tubes to the maximum and made a last desperate attempt to stop the German infantrymen that were already closing ranks with the defensive perimeter in the village itself. As darkness settled over Graignes, the Germans continued their relentless drive and, before long, it was clear that the paratroopers would not be able to hold on much longer. By the time the Germans made the final thrust into Graignes that night, the defenders had been reduced to a few isolated pockets of resistance spread out around the village. In many cases, men were beginning to run out of ammunition. As that happened, the enemy was quick to exploit the situation by overrunning the outer perimeter and moving into the streets of the center of the village. Those points of the line that were not overrun were cut off from communication with the command post and the aid station. With the Germans swarming over the center of the village, the American tactical situation in Graignes fell apart at the seams once and for all. The defenders had done everything in their power to hold out, but they were simply too disadvantaged by the overwhelming numerical superiority of the enemy. With Maj. Johnston dead, command of the force at Graignes devolved to Capt. Brummitt – who ordered the men to pair off and try to make it to either Carentan or Ste.-Mère-Église. With that, paratroopers began slipping away from the village and into the night. After the Americans evacuated and the Germans captured the village, something terrible happened. Elements of the 17th SS Panzergrenadier Division had conducted the final assault on Graignes. When the 17th attacked, it was with a regimental sized force of approximately 2,000. The odds were literally ten to one in the Germans’ favor. Despite those odds though, the 182 paratroopers defending Graignes inflicted an estimated five hundred killed and seven hundred wounded on the Germans during the course of the fighting on the 10th and 11th. The stubborn and determined American defense that gave the 17th such high losses brought on a vicious and brutal reprisal. At the end of the 11 June battle, the 17th SS stormed the church and found Capt. Sophian’s aid station. They promptly forced the Captain and all of the wounded outside where they were made to line-up against a wall. The men were then divided into two groups and marched away from the church. One group (nine troopers) was marched off to the south and the other group (five troopers) was marched down to the edge of a shallow pond behind Madame Boursier’s café. At the edge of the pond, the SS bayoneted the wounded men and threw them into the water one on top of the other. The other group of 507th paratroopers was forced to march four kilometers to the south to a field near the village of Le Mesnil Angot. There, the nine wounded men were forced to dig a pit. As soon as the pit was complete, the SS shot each one of them in the back of the head and dumped their bodies in the pit one on top of the other. The murder of the paratroopers was only the beginning of the atrocity at Graignes. While one group of the Germans led the Americans off to execution, other Germans began systematically rounding-up French civilians suspected of assisting them. At about the same time, a group of SS men proceeded to the church rectory seeking revenge. They knew that the church’s belfry had been used throughout the battle as an observation point. They knew that the accurate and devastating mortar fire that had been controlled by the observers in that belfry had killed and wounded hundreds of their comrades. Consequently, they sought to make an example out of the people at the church whose interaction with the Americans had permitted those casualties to happen. The Germans burst into the rectory, dragged Father Leblastier and Father Lebarbanchon into the courtyard and shot them both to death. The Germans then discovered Madeleine Pezeril and eighty-year-old Eugenie DuJardin. Overwhelmed with fear, the two ladies had been cowering in their quarters ever since the beginning of the final assault. The Germans shot and killed both women in their beds. Meanwhile, a total of forty-four villagers had been rounded up and were under interrogation by the Germans as suspected collaborators. They were threatened with execution if they did not turn in the names of any and all villagers who had actively assisted the Americans, but not a single one of them turned in a single name. In fact, none of them revealed the prominent role that Alphonse Voydie had played in the Graignes drama. Had the Germans known that Voydie had been the catalyst of organization that he was, they would surely have executed him too. The villagers’ refusal to cooperate only exacerbated the Germans’ fury. Many of the detained citizens were immediately sent south to nearby Le-Haut-Vernay where they were forced to help remove the hundreds of Germans who had been killed or wounded in the day’s fighting. This lasted practically the entire night. Then the next morning (12 June) the Germans began ransacking every house in the village. During their searches, furniture was overturned and rifled through and valuables were plundered. Many of the villagers that had fled the previous night’s attack attempted to return to their homes that morning only to be turned away on the outskirts of town. Machine guns that had been set up at several strategic approaches presented an uninviting sight to the exhausted villagers. On Monday morning, Odette Rigault ventured out from the family farm for the first time since the Germans overran Graignes. She had not gone very far when she saw a tall paratrooper coming toward her. That soldier was Lt. Frank Naughton. Like so many other 507th men, he and his men had evacuated Graignes in the closing moments of the battle and then had spent the entire night wandering through the marsh. Although she did not speak any English, Odette nevertheless attempted to warn Lt. Naughton that the Germans were everywhere. She then led him to the barn where her family had stored the ammunition on D-Day. Naughton left with a few others later in the morning. Throughout the day, 507th troopers continued to emerge from the marsh and converge on the Rigault farm. These men had been there on D-Day and returned hoping that the family would help them again. Without hesitation, the Rigaults threw their support behind the mission of protecting the 507th men. Before long, the family had a barn full of troopers – 21 in all – that had to be fed each day. Marthe and Odette assumed the responsibility and began a daily routine of surreptitiously delivering meals to the barn. For the men cooped-up in the barn, the days passed with frustrating slowness. They had to be very careful not to make any noise, so they could not move around much and they could not even speak in normal tones. 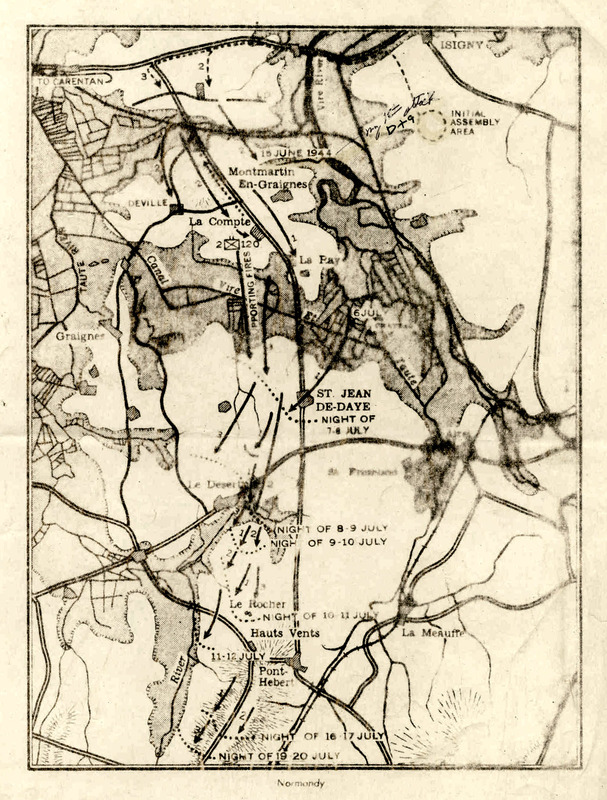 The Rigaults and the Americans were hoping that a breakthrough would occur and that Allied forces from the north would move into the area around Le Port St. Pierre and Graignes. As long as such a possibility existed, there was no need for the Americans to risk venturing from their hiding place in the barn. The fact that the 101st Airborne captured Carentan on the 12th hinted that such a breakthrough might happen, so everyone waited and hoped for the best. Disappointingly, Tuesday the 13th brought no news of an advance from Carentan. When the situation remained unchanged on Wednesday the 14th as well, it began to sink in that a breakthrough might be days, if not weeks away. The Rigaults and the twenty-one paratroopers therefore reached the conclusion that the best thing to do would be for the Americans to attempt to reach Carentan. Since the area was swarming with German patrols, the only safe method of transporting the paratroopers would be at night by boat via the shallow canals that crisscrossed the marshy inundated area north of Le Port St. Pierre. M. Rigault recruited 15-year-old Joseph Folliot to take the men using a 24-foot construction barge. At 1000 hours, 15 June, Joseph and his boatload of paratroopers left on the treacherous journey up the canals to Carentan. Two hours later, Joseph pulled over to the bank and said, “We’re okay now, get off here and follow the path for about one hundred meters and you will be in American territory.” The paratroopers were indebted to Joseph and attempted to give him their invasion currency as a gesture of appreciation, but Joseph would accept nothing. Google gives a good look at the town. All we have to do is find an old map of the town, or pictures. Will search the net tomorrow. Details about the surrounding and the town. West of the town near the Taute river the Germans flooded the terrain. The church was located at the monument, and wasnt rebuild. Also additional info that part of the German force were Das Reich men. what should I do with the map? I see 1 road from N to S, did the Germans come from the N? Where is the bridge? The bridge needs to be a target on its own. Report spoke about infantry, so the 17th panzergrenadiers. I think the Das reich men were probably recon force. Will try to find more. 17th was located south of Carentan. Frank P. Costa, Sr. is 91 years old and resides in the Home Sweet Home assisted living residence in Kingston, NY. Quite by accident, I saw my father in a TV ad for Home Sweet Home on a local TV station. I mentioned the TV ad to a cousin of mine and we talked about possible residuals that should go to his estate for the heirs to split. Of course, this was a ridiculous discussion and we got a good laugh out it. My father suffers from dementia and many of his memories of the past are no longer accessible to him in any detail. Having a discussion with him, of any consequence, is just about impossible now. Dad was a paratrooper in the 82nd Airborne Division of the U.S Army during World War II. He was in the 507th Parachute Infantry Regiment. His first combat jump was on the night of June 5-6, 1944 into Normandy France - D-Day, the allied invasion of Europe. The designated landing zone was the area around the small town of Ste. Maire Egliese. It was on the only main road to the fortified city and deep water port of Cherbourg, further west. Ste. Maire Egliese was the principal objective of the 82nd so that the Allied armies could prevent any German rescue or resupply of Cherbourg. My father was positioned as the first soldier to exit the plane when the green light, the jump signal, was given. On his training jumps he was always faint and queasy in the aircraft. He couldn't wait to get out of the plane and into the fresh air. So the jump sergeant sat him next to the door of the C47. The triple A flak (anti-aircraft artillery) was so heavy, the pilot veered to avoid the danger and gave the jump signal at a purely arbitrary moment. Many of the pilots in the following planes, with other 507th paratroopers, followed the lead pilot's right turn. They landed more than 30 km from their intended drop zone. Dad landed in a flooded field, up to his shoulders in water. He cut himself out of the risers on his parachute with his trench knife, but he lost his M1-A carbine. With the arrival of dawn, he spotted a church on high, dry ground and made his way out of the water. He regrouped with his regiment, part of it anyway, in the tiny hamlet of Graignes, maybe 15 km from Carentan. The village church with a tall bell tower was the most recognizable feature and occupied the highest elevation in generally flat terrain. The church was of typical medieval Norman design, but I don't know how old it was. One-hundred seventy-six soldiers (176) assembled, including a few from the 101st Airborne Division, the Screaming Eagles. There was one Army Airforce fighter pilot. None of the surviving vets remembers where the fighter pilot came from. The 507th was a headquarters outfit. That meant they had mortars, 50 caliber 'light' machine guns, and lots of explosives. They also had a lot of communications equipment, but they were too far away to contact any of the allied units. They were completely cut off from all communications. They had some great officers with them - a Colonel ('Pip' Reed), a Captain, and number of Lieutenants. The first thing they did was ascertain where they were with the help of the locals. They were so far off the drop zone that their location was off their military map. After much deliberation and argument, Colonel Reed decided to stay and set up a defense perimeter, rather than try to get back to the friendly lines through unfamiliar terrain and mostly flooded fields. The head of the French Resistance in the area was a Graignes farmer, named Regault. His second in command was the Mayor of the Hamlet. The trusted locals were instructed the night before, by Regault and the Mayor, that the invasion was coming and that they were expected to do their duty when the time came. Regault had two daughters, Yvette 18 and Marthe 12. They were to become heroes in their own right and save the lives of many of the Americans. The first thing the locals did was to scour the area for the equipment and supplies that were parachuted with the soldiers. They smuggled the equipment in their horse carts and wagons. The proprietor of the local restaurant, Mme. Brousier, organized her suppliers to bring in large quantities of food stuffs to feed the paratroopers. They had to smuggle and be discreet so as not to attract the attention of the German soldiers in the area. The Germans soon learned of the existence of the Americans, but did not know who they were, how many, or how they were equipped. Some of the young French girls ran off to alert their German soldier boy friends. Eventually the 507th set up a defensive perimeter, dug in, zeroed in all the roads with their mortars, and then sent out patrols. The first advance by the German soldiers toward Graignes was a small patrol. They were dispatched very quickly by the mortars and machine guns. The next day it was a larger German patrol, but they were destroyed as well. Colonel Reed decided they had to destroy a concrete bridge, the only bridge on the only road, that led straight to Graignes and the Americans. My father was part of a platoon, led by Lieutenant Frank Naughton, that was assigned to blow up the bridge. Naughton and his men set up defensive positions in the hedgerows while the demolition experts set the charges under the bridge. My father and one other soldier were sent across the bridge to set up a reconnaissance point to watch for any advancing Germans. They were positioned where the road made a 90 degree turn to the right. Among the hedgerows it was impossible to see more than about 50 meters in a straight line, at most. By this time my father had a Browning Automatic Rifle (BAR) instead of a carbine. Sure enough, he spotted a large German patrol comprised of several hundred soldiers and led by a half-track armored personnel carrier. He sent the other soldier back to the bridge to warn Naughton and tell them to hurry with the demolition charges. The Germans continued a steady advance. At one point my father let go with a burst or two from the BAR. This served to scatter the Germans and slow them, temporarily. After a few more bursts, he left his concealed position and ran back to the bridge. The turn in the road and the hedgerows concealed my father from the Germans. Naughton and his platoon were concealed as well. The demolition charges were set and ready to go. Naughton and most of the platoon were to the right of the road, as they faced the oncoming Germans. My father and a few others were on the left, and had a better view of the advancing Germans. My father, trying not to give away his position, hollered over to Naughton to blow the bridge. Naughton indicated he wanted to wait until the German soldiers were on the bridge. With several hundred German troops advancing, and my father having a better view of road ahead, said again to Naughton to blow the bridge. Naughton still wanted to wait. It was very tense, all the way around. With the Germans just about on the bridge, my father YELLED to Naughton, "Goddamn it! Will you blow the fu***** bridge!" BOOM! There were a couple of German soldiers on the bridge who were obliterated as concrete debris was blown sky high. A fire fight broke out. The Americans were concealed very well and inflicted a lot of casualties on the Germans. At least one German soldier tried to wade across the small river on my father's side of the blown bridge. That was the very first human being my father ever killed. It was always vivid in his memory over the many years he talked about it. He also talked about how he felt and that this was another soldier like himself doing his duty. Dad and his buddies, whom I met over the years, were always proud of the fighting they did, but not one of them ever took any satisfaction in the killing of another human being. When I accompanied him to the 50th anniversary of D-Day (actually it was in September of 1994) he talked about the fact that he “killed a lot of guys.” It was not a boast, but a conscious statement of what he had to do. What was unsaid, but understood, was the wish that it would never have happened. Each successive day a larger force was sent against Graignes. From this point on, the American positions were shelled by artillery fire from a single German 88mm field piece. The Americans could see the field gun being positioned in the distance, outside the range of their mortars. Every night the artillery barrage from the '88' would last a straight hour. At daylight the German troops would advance directly on the American positions across an open field. In the words of a couple of my father's fellow soldiers (I also attended the 42nd anniversary in 1986), “The German's had to be green troops. They were inexperienced. They stood up and marched right at us and we slaughtered them with our mortars and machine guns.” This predictable scene repeated itself for a couple more days. The people of the hamlet, those who tried to leave the area, were pressed into service by the Germans to retrieve the wounded and dead soldiers from the battlefield each day. The Americans were starting to take casualties. The local priest and a priest friend of his from another region set up an infirmary in the small school house. They and a few other locals tended to the wounded. Each morning the priest offered mass and as many GIs that could be spared would attend. The woman who owned the restaurant continued to provide food for the soldiers, but with depleting stocks. Most of the time the soldiers were fed 'on the guns', at their combat posts. One morning when my father was in church at mass, someone ran in and said, “The Germans are launching another attack.” The church emptied in a matter of seconds. Everyone returned to their combat positions. Food was getting low. What was once a very large supply of ammunition, mortar shells, and explosives was now getting to a critical level. The Colonel felt that the next assault might render their position uncertain. In fact, the Germans were reinforcing their existing soldiers with Panzer Grenadiers and a detachment of Waffen SS. The final assault on Graignes was about 4,000 German troops. To prepare for the expected heavy attack, Naughton sent my father and one other soldier, his name was Eddie Page, to dig in and create a defensive position near the flooded field on the back side of Graignes about 150 to 200 meters and down hill from the church. It was unlikely that the Germans would attack from the water, but he wanted to cover the possibility. The shelling started at night, as usual, only this time it would go on for two hours instead of one. Not long after the shelling started, Charlie joined Dad and Eddie in the fox hole by the water. Charlie had been directing mortar fire from the church bell tower, the highest point in the area. Minutes earlier Charlie was relieved by one of the Lieutenants. Dad, Eddie, and Charlie looked up as the bell tower took a direct hit from the '88'. Well, Dad, Eddie, and Charlie were in their 6 x 6 x 6 foxhole, completely oblivious to the outcome of the nighttime assault. In the morning it was all quiet. Dad got out of the foxhole and took a deep stretch to squeeze out the sleep and tiredness. As he did, he saw three soldiers digging a foxhole about 50 meters from his position. At least one was wearing a German army helmet. His reaction was as instantaneous as it was instinctive. He jumped back into his foxhole and woke Eddie and Charlie and hushed them at the same time. He had not been seen by the Germans. They were dug in next to a hedgerow. So, he sent Eddie into the hedgerow to make his way toward the center of the hamlet and see what was going on. (I've been to the hedgerows. Although the hedgerows are dense, they actually are two dense, parallel rows with a walkable path between the them.) Eddie came back and said the place was crawling with Germans. Also, he saw the Captain being led away with his hands raised. Dad got the three of them into the hedgerow where they had very good concealment. Of course they talked about what to do next. Eddie said, “We ought to stay here and fight to the last man!” Dad and Charlie gave a surprised look at each other and then turned to Eddie and said, 'a due', “What for?” They were unimpressed with Eddie's reasoning based on the fact that they were paratroopers. So they hid for two days in the hedgerow. Dad was getting light-headed from a lack of food. Eddie wanted to stay and wait for relief, if it would ever come. Dad and Charlie decided to try to make their way back to friendly lines. Eventually, they convinced Eddie to come along. On a road they met a farmer and held him at gun point. The farmer gestured to follow him. They had no choice, but they kept a rifle on him at all times. He knocked on a farm house door; a frightened woman opened and let in the soldiers. She gave each of the soldiers a crepe, which seemed to be the only food they had in the house. The farmer and woman spoke briefly, then they were led to another farm house. It was the farm of the Regault family. The twelve year old daughter, Marthe, was there and led the three into the barn where 11 other paratroopers were hiding in the hayloft. The night of the final attack, the Americans were wandering aimlessly in the dark trying to flee the Germans. Regault and his two daughters went out into the night to find the American soldiers and lead them back to his farm. They did not go together as a trio. Instead, Regault sent each of his daughters in different directions, and he covered a third area, himself. They would find the soldiers, hide the soldiers in their barn, and then sneak them out of the area at night on a canal boat. My father, Eddie, and Charlie were the last ones to be found and hid in the barn. The Germans were patrolling the area. Young Marthe and Yvette had to go about their farm chores in as normal a way as possible so as not to arouse any suspicions. As they could, they passed a little food and drink to the soldiers. At one point two German soldiers came into the barn to inspect it. The Americans had their weapons trained on them the whole time. Fortunately, they did not go further than inside the door and then left to resume their patrolling. After the war, it was determined that members of the 507 Parachute Infantry Regiment killed at least 800 and possibly as many as 1,200 German soldiers in the Battle of Graignes. The local priest and the visiting priest stayed with the wounded soldiers in the school house infirmary. They intended to minister to their wounds and plea for them with the Germans. When the Germans secured the small hamlet, they went into the school and bayoneted the wounded Americans. A number of the captured Americans were shot. The two priests were singled out, shot inside the ruins of their church, and their bodies dowsed with petrol and burned on the spot. Eventually, Regault, the Mayor, and other members of the resistance were captured and executed by the Germans. The boatman who piloted my father and 13 others to safety was found with all of the money my father insisted he take. The Germans put two and two together and shot the hero who saved their lives. You can imagine how my father felt about this when he found out more than 40 years later. More of the locals were scheduled to be executed, including Marthe, Yvette, and the restaurant owner, Mme. Brousier. Without explanation, a German officer said there had been enough killing and ended the reprisal executions. Lieutenant Frank Naughton stayed in the military and retired after a distinguished career as a full 'Bird' Colonel. He returned to Normandy and Graignes in 1984, on the 40th anniversary of D-Day. He realized that the local farmers of the hamlet of Graignes were never thanked nor shown any other appreciation for what they did, fighting side-by-side with the American paratroopers, in the Battle for Normandy. So Colonel Naughton spent the next two years researching and documenting the actions of the residents of Graignes. The Department of Defense, led by John Maher, Secretary of the Army, returned to Graignes in 1986 to recognize the people of that hamlet. A number of the surviving residents, including Marthe, Yvette, and the restaurant owner, were given the highest award that the DOD, Department of Defense, can bestow on a civilian. Others received their medals posthumously. Many other medals were awarded to the people of Graignes, as well as to the surviving American soldiers. I accompanied my father on his return to Graignes in 1986, along with many of his surviving buddies from the 507th. I had the honor of serving as interpreter for the GIs with the locals. Armed with my high school and college French and a pocket dictionary, we managed to communicate quite well. I had to invent a few terms (fusile automatique Browning) but everyone got the gist of my stories. We learned that one year after the war, Yvette was married. She sewed her wedding dress from the white nylon fabric of a parachute she salvaged from the Battle of Graignes. She showed us the pictures of her wedding. She still has the wedding dress. *The 507th was a headquarters outfit. That meant they had mortars, 50 caliber 'light' machine guns, and lots of explosives. They also had a lot of communications equipment, but they were too far away to contact any of the allied units. The 'Ma Deuce' .50 Cal. MG could never be called a 'light' piece, unless one was referring to it as a 'light auto-cannon'. In my experience it was always referred to as a 'Heavy MG'. Yes, the 50 cal is in the weapon data base. One of the standard units has them in its inventory, glider or para, not sure. The report I found did mention a recon unit from Das Reich. what could it be than? they do talk about a .50 light? something about the cooling perhaps? I know it is but what's the difference between .50 and .50 light? what report are you talking about? post it here plz. found some maps or pictures? There is no such thing as a .50 Cal. Light MG. What we may have here is someone who was not an MGer, looking at the .30 Cal. MMG and thinking it was a light 50 because it looks virtually the same and was very much lighter. This is not the first time I have come across a historical reference to a piece of equipment that did not exist in reality. can you shine a light on what's written on Wiki? Never heard of a leight weight version? Report is in one of my D-day books. Should be the same platoon responsible for the killings of civillians in neighboring villages. We may be speaking in relative terms here, as no version of the .50 Cal. is actually light. There may be some that are lighter than others (which makes them relative) but they are all still heavy. I believe only the glider troopers used the .50 Cal. MG for that very reason. I know there was a water cooled version, much the same configuration as the .30 Cal. water cooled. If such a thing did exist, I suspect CM doesnt have them in the mix due to their rarity.